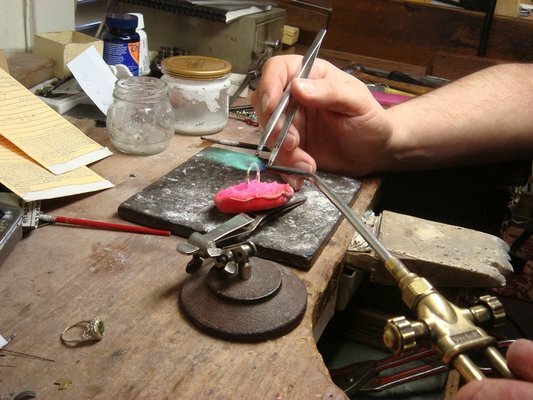 Proper jewelry care and maintenance is an important part of keeping your jewelry looking beautiful. Edmund Weber Jewelers offers a full range of professional jewelry repair, refurbishing, and refinishing services that will restore the beauty your jewelry had when it was new. Our repair services include ring sizing, mountings stone replacement, retipping prongs, jewelry cleaning & polishing, necklace repair, bracelet repair, and clasp replacement. Have a ring that doesn't fit anymore? We can determine your proper ring size and professionally size your gold or platinum ring to fit perfectly. Resizing services are available for all ring sizes. Is your diamond loose in its setting? Proper maintenance and prong retipping can prevent you from losing stones from your jewelry. Missing a gemstone from your jewelry? Our jewelers can replace the stones in any setting -- solitares, three-stone rings, tensions settings, channel settings, bezel settings, and more. We can also set loose gemstones in your chosen mounting. Want to use your old jewelry or stones to create a new custom design? We can create a beautiful new piece of custom jewelry to your specifications using a variety of techniques from wax casting to hand fabrication. Unsure about the right way to clean your jewelry? We can clean, polish, and restore your jewelry to look like new. Our jewelers can also give you tips on the proper cleaning techniques and products for your specific jewelry.